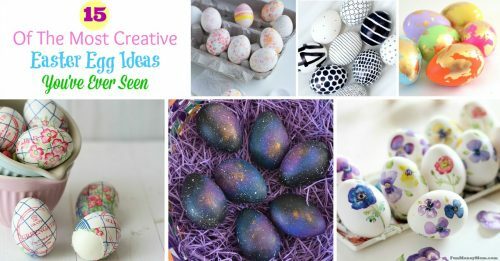 Looking for Easter tablescape ideas but don’t have time for anything eggstravagant (sorry, couldn’t help myself)? 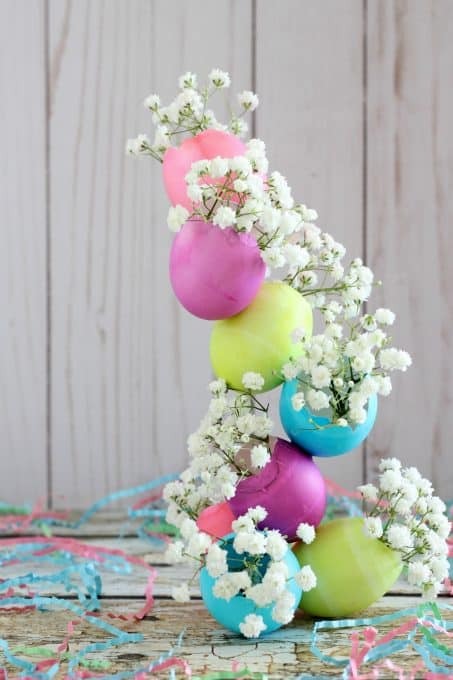 This colorful Easter egg centerpiece will look beautiful on your table and the best part is that it costs next to nothing to make! This post contains affiliate links to help you find the supplies you’ll need to make this craft. There’s a lot to do to get ready for Easter. 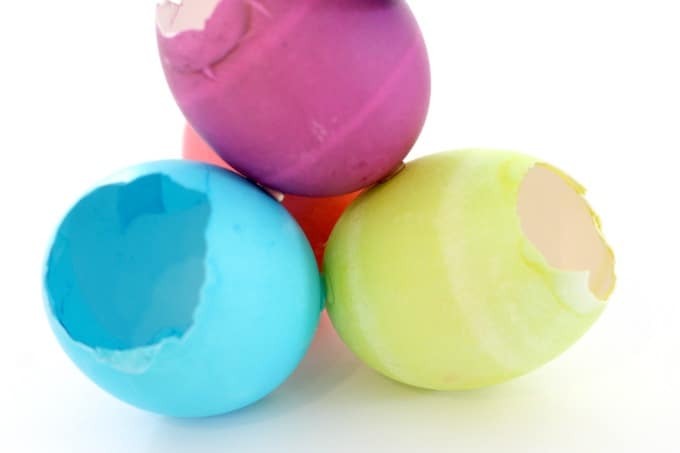 You have to decorate your eggs, plan Easter egg hunts and decide on an Easter menu. If you’re hosting Easter dinner, you’ll want to make sure the table looks nice too but who has time to come up with an elaborate tablescape? 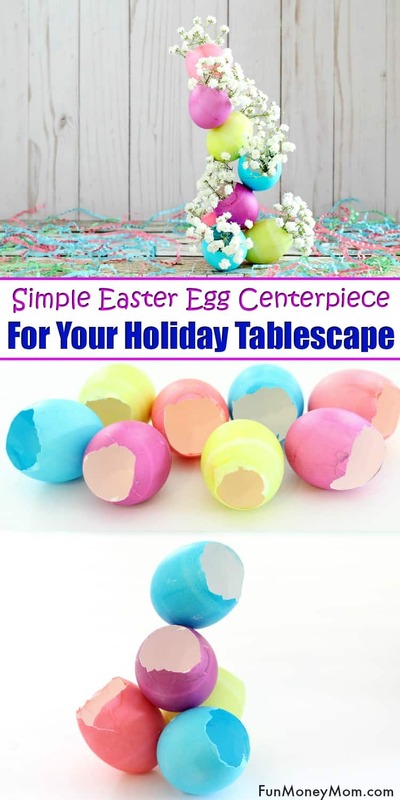 That’s why this Easter egg centerpiece is so perfect. It’s so pretty that it looks like you put a lot of effort into it. Nobody ever has to know just how easy it really was! For a couple days, I’d collected the eggs that we used for breakfast. I’d just lightly tap the top of each egg with a knife until they cracked. Then I peeled the top off, leaving a hole just big enough for flowers to fit. Don’t worry if it’s not perfect. You won’t see the imperfections once you add the flowers. After two days of making breakfast for the fam, I had enough eggs for our centerpiece. 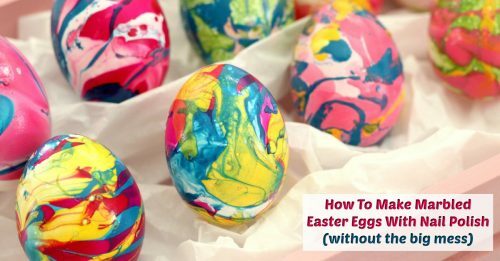 Next I colored the eggs by combining 1/2 cup of water with a teaspoon of vinegar, then added food coloring to get the colors that I wanted. 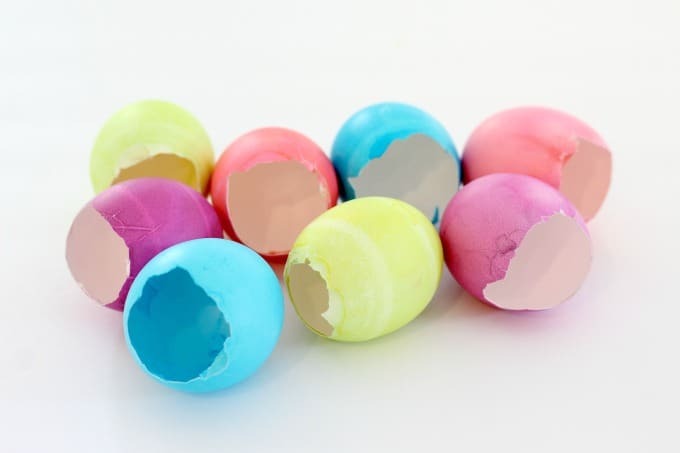 Once they were dry, the eggs were ready to assemble. I used hot glue to attach three eggs together for the base, with the holes tilted slightly up. Next I started adding more eggs, one at a time. 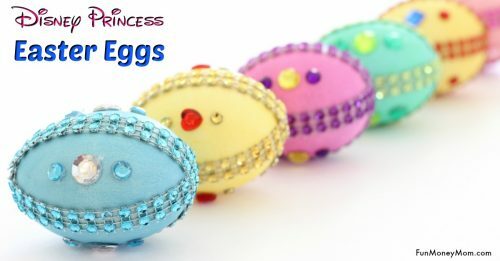 As you hot glue the eggs, be sure not to push together too hard or your shell may crack. I added eggs going up at different angles. There’s no right or wrong way, just be sure that they are balanced so that your centerpiece doesn’t topple over. 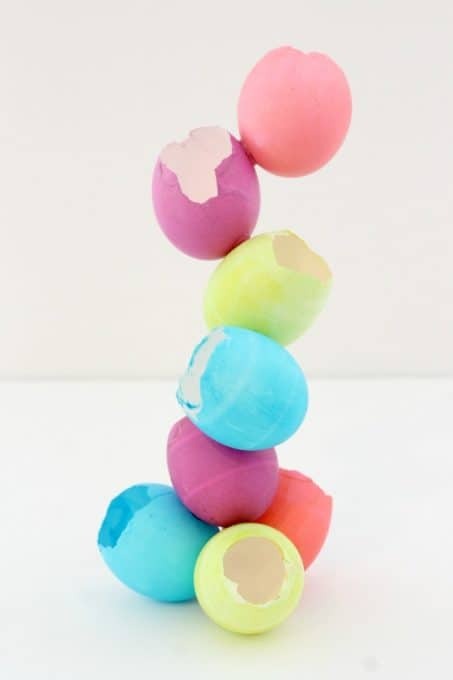 Let the hot glue dry before adding another egg. Keep going until you’ve used all eight eggs. 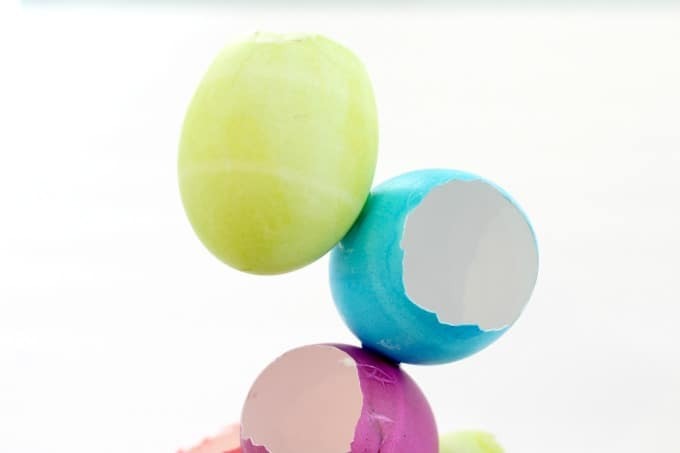 If for some reason your centerpiece is wobbly, you can always add one more egg to balance it out. Now all you need are flowers and the lighter, the better. Heavy flowers like roses will crack the eggs but this baby’s breath was perfect and the grocery store had a big bouquet for under $5. I didn’t put water in the eggs and the baby’s breath still lasted for a couple of days. When it started looking a little sad, I just threw it away and added more sprigs from the bouquet, which I had in a separate vase full of water. Since the eggs are already so colorful, I love how the white flowers balance it out. This is going to look so pretty on my Easter table and I’m already using it as Easter decor on my breakfast bar. 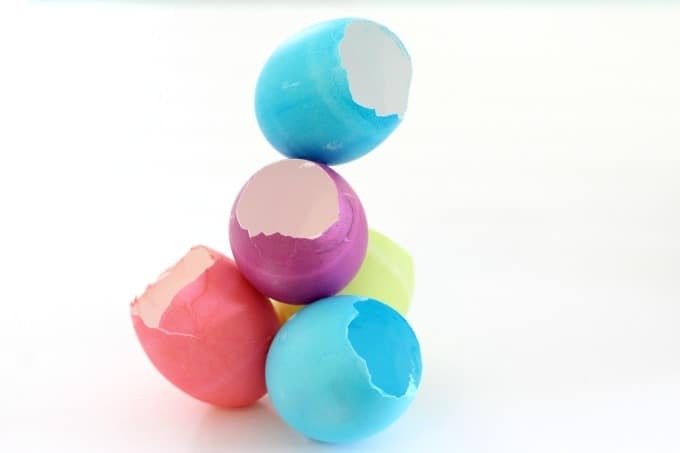 Do you go all out for your Easter tablescape or do you like to keep it simple? 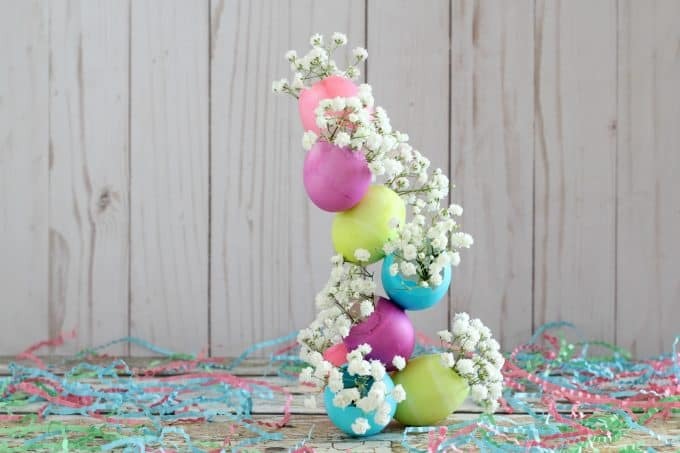 What other ideas do you have for a pretty Easter centerpiece? 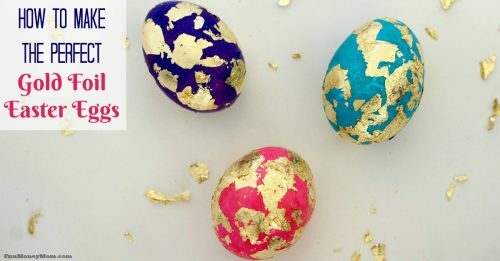 If you’re looking for more fun Easter egg decorating ideas, check out my latest segment on Sarasota’s Suncoast View.